Hradec Králové is a city in north-eastern Bohemia and the capital of the region with the same name. It belongs to the oldest cities in Czechia. At the confluence of the rivers Elbe and Orlice (where Hradec Králové is located), there was a settlement already in the times of ancient Rome. The first written mention of Hradec Králové as a town was found in the deed of Premysl Otakar I of Bohemia from 1225. The city’s name literally means “the Castle of the Queen”. The queen which is referred to in the name, was Elizabeth Richeza – the wife of two kings: Wenceslaus II of Bohemia and after his death Rudolph III of Habsburg. Hradec Králové was one of her dowry towns. Nowadays, Hradec Králové is a fascinating mix of history and modernity. The city has its own university. It is also famous for Petrof pianos, which have been manufactured there since 1864 until today. Hradec Králové has one of the most beautiful skylines of all cities in Czechia, dominated by the Gothic Cathedral of the Holy Spirit and the Renaissance White Tower. The East Bohemian Museum (Muzeum východních Čech) is housed in an interesting Art Nouveau building designed by the famous Czech architect Jan Kotěra and completed in 1912. The museum has an extensive collection of archaeological and historical artefacts from the region. Large Square (Velké náměstí) is the central square of the city. Its shape resembles rather a triangle than a square and this is the place where you can see the very pretty skyline of Hradec Králové. It features the Gothic Cathedral of the Holy Spirit (katedrála svatého Ducha), the Renaissance White Tower (Bílá věž) and the Baroque Old Town Hall (Stará radnice). This picturesque spot is great for postcard-type photographs. There is an airport in Hradec Králové. However, at the time of writing there are no scheduled flights there. There is an airport also in the nearby city of Pardubice, but the number of flight routes served by this airport is very limited. If you would like to arrive in Czechia by plane and go to Hradec Králové, then booking a plane to Prague (PRG) and then taking a train/bus should be the simplest option in most cases. There are direct trains from Prague to Hradec Králové. The journey time is approx. 1 h 40 min, if you take a fast train, called rychlík in Czech. 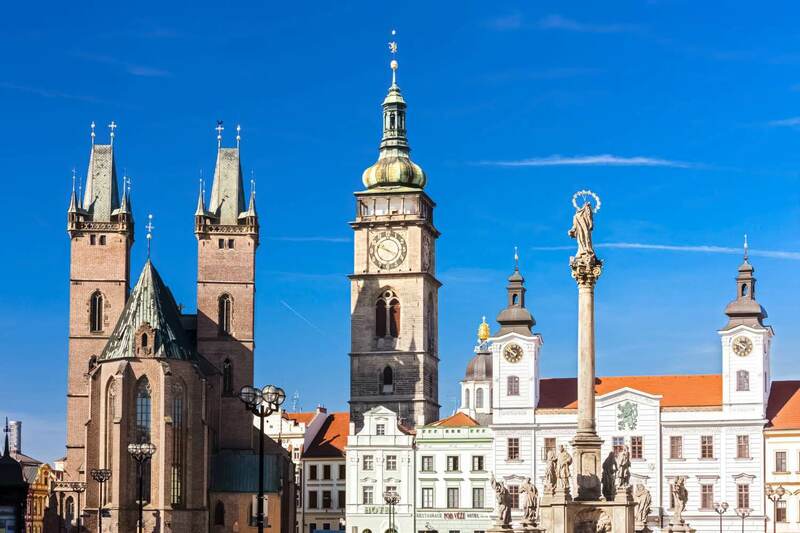 Another popular option is taking a Pendolino / Eurocity / Express train from Prague to Pardubice and changing there to a local train going to Hradec Králové. Depending on how long you have to wait in Pardubice for your connecting train, this option may be a few minutes faster. These trains are faster than rychlíks, which are only one category above local trains. You can find detailed timetables on the website of the Czech Railways. Of course, it is also possible to get to Hradec Králové by bus from many places in Czechia. Here is a good website to check the options and timetables.